Summer is just about over. That means back-to-school for all the kids out there. From a lunch box perspective, parents and even grandparents want to know what healthy snacks they should pack with them to school. Growing up, I remember snack time at school. That break in the day where I got to indulge with whatever treat my parents (likely my mom) packed for my lunch. I got all the best stuff: fruit snacks, potato chips, cookies, pastries, crackers, and everything with chocolate or cream in the middle of it. It wasn’t until years later that I realized that these snacks were unhealthy, and definitely not the best choice for a growing boy. In fact, many of these snacks marketed to kids are loaded with refined sugars, trans fats, and artificial colors and other chemical ingredients. It can mean different things for different people. One kid may suffer from behavioral issues, while another may have problems learning. Anxiety, depression, mood swings, and stomach issues may also be a problem. Many things can occur when the nervous system, immune system, endocrine system, digestive system, and more, are bombarded daily with sugars and other chemicals. A holistic nutritionist friend of mine has even started a “no snacks movement” earlier this year. It began when her daughter came home upset because her teacher told her she needed to eat a snack. You see, snacks are unnecessary if you are eating enough during your other meals, like breakfast, lunch, and dinner. The basis of my friend’s “no snacks movement” is that most snacks marketed to children nowadays increase blood sugar. Eating sugar, carbs, and too much food, in general, will also raise blood sugar levels. This then increases the risk of diabetes or pre-diabetes, which affects more than 100 million Americans. I don’t believe schools should eliminate snacks, but eating them should serve a purpose. That purpose should be to balance your blood sugar. Healthy snacks should contain healthy fats, protein, and fiber. Rather than eating three large meals a day, maybe you should eat five or six smaller meals, which include a snack-sized meal or two. This article has healthy snack recipes for back-to-school. So, parents and even grandparents can make healthy snack recipes for their kids that are truly good for them. When I was in school, there was no nut ban like you see in a lot of schools today. Instead, I am going to provide a seed protein bar that is also full of healthy fats and fiber. It will balance your blood sugar and help regulate the immune system. This healthy snack recipe makes 16 bars, which should definitely take care of snack time when you have multiple kids to pack for. Using a clean spice or coffee grinder, roughly grind the flaxseeds. Then clean the grinder and roughly grind the sunflower seeds as well. Preheat the oven to 300°F and line a baking sheet with parchment paper. Leave several inches of overhang on all sides. In a large bowl, combine all the ingredients, except for the water and coconut nectar. Stir until well combined. Add the coconut nectar and water, and mix with a fork until well incorporated. Spread the mixture evenly into the baking pan, and firmly press it into the corners and sides. Bake in the oven for 35 minutes. Remove from the oven and place on a wire rack for cooling. Using the parchment paper overhang to protect your hands, press down to firmly compact the bars before leaving them to cool for about 30 minutes. Once the bars have cooled, invert them onto another piece of parchment paper on the wire rack. Let it cool completely and cut into two to three-inch bars. You can individually wrap them for your child’s school snacks. Macaroons were a common snack at my lunches, but they were loaded with sugar and not very good for me. As an alternative, here is a high-fiber, high-protein, high-fat recipe that contains psyllium husk, eggs, and shredded coconut. There is also cinnamon, turmeric, and salt that provides lots of nutrients as well. The snack recipe will make 18 macaroons. They will keep for up to a week in an airtight container at room temperature, or for six months in the freezer. In a bowl, combine the psyllium husk, coconut, turmeric, cinnamon, salt, and lemon zest if using. Then add the vanilla, eggs, and coconut nectar, and mix well. Using a tablespoon, scoop out balls of the dough, and drop them onto the baking sheet. Bake for 15 minutes or until golden brown. Chia pudding can be a snack or even a meal. It is that filling! This refined, sugar-free snack contains healthy fats and protein with chia seeds, coconut milk, and hemp hearts. The berries also provide fiber, while the vanilla and maple syrup give you a little bit of sweetness. This recipe makes four to six servings. Serve it in a small glass bowl with a lid for your kids. In a medium bowl, combine coconut milk, water, vanilla, maple, and chia seeds. Then stir well, cover, and refrigerate overnight or at least four hours. In the morning, top with cinnamon, hemp hearts, and berries. Rather than potato chips, I suggest this next snack recipe. Chickpeas have both fiber and protein, and unlike junk food, they contain lots of beneficial minerals, such as manganese and folate. And, of course, herbs are packed with nutrients as well. This recipe is also a delicious way to kill a chip craving. At the same time, the protein and fiber in this snack will help control your appetite while also getting you through your day with plenty of energy. In a medium bowl, combine chickpeas, oil, rosemary, oregano, thyme, and sea salt until well coated. Spread the chickpeas on the baking sheet, and bake for 30 minutes or until crisp. Pack in two or three small glass containers for your kids. This cookie recipe contains hemp hearts and ground flaxseed. Both contain fiber, protein, and healthy fats. The coconut in the recipe is also an excellent fat and protein source, while the cinnamon is useful for balancing blood sugar. The hemp and flax cookie recipe will make 24 cookies. It will keep for two weeks in an airtight container at room temperature, or six months in the freezer. Preheat the oven to 350°F and line two baking sheet with parchment paper. In a medium bowl, combine the water and flaxseed, and let it sit for 10 minutes. In a large mixing bowl, combine the coconut, hemp, cinnamon, ginger, and salt. Add the coconut butter and honey to the flax. With a hand mixer, beat the mixture until it is smooth, for about a minute. Fold the wet mixture into the dry ingredients, and combine well. The texture should be fairly dry. Scoop out one tablespoon of the mixture, roll it into a ball using your hands, and place it on the baking sheet. With wet fingers, flatten the top so that the cookie is one quarter-inch thick. Repeat until all the dough is gone. Bake for 10 minutes or until they are slightly golden. 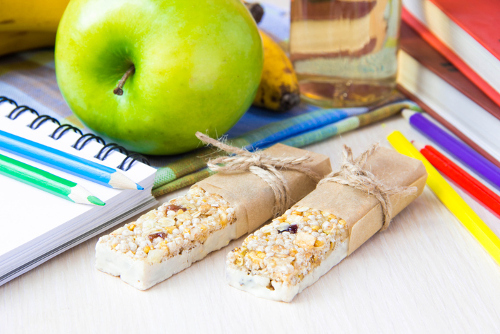 Packing a healthy lunch plus snacks for your children can be quite the challenge these days, especially with most schools going the nut-free route. Most of the time, I think having no snacks is a good idea since a lot of processed snacks on the market can cause more harm than good. However, if you make your own snacks, you will know exactly what you’re feeding your kids. The healthy snack recipes provided give you some options that will balance your child’s blood sugar. As a result, they will have more energy, concentration, and overall brain power to thrive in school. Daniluk, J., “Hot Detox: A 21-Day Anti-Inflammatory Program to Heal Your Gut and Cleanse Your Body (Toronto: HarperCollins Publishers Ltd., 2016), 308-312. McCarthy, J., Joyous Detox: Your Complete Plan and Cookbook to Be Vibrant Every Day (Toronto: Penguin Group, 2016), 173, 259.